:: www.peterberger.at :: Articles :: BreezeBrowser template "PBase"
www.peterberger.at > BB template "PBase"
You can install the "PBase" template by downloading the file pbase.zip and extracting it to your default template directory (which is usually located at C:\Program Files\BreezeSys\BreezeBrowser\templates). You should end up with a directory called "pbase" underneath the template folder. In version 2.8 BreezeBrowser intruduced two template specific user settings in the HTML dialogue. The PBase template makes use of these two variables to set the style and the caption. At the bottom of the HTML dialogue you will find two drop down boxes, "Style:" on the left and "Caption:" on the right side. Try out the different styles to see which one you prefer. A big advantage of this template is that it´s possible to offer the fullsize images in different sizes. To achieve this it´s necessary to generate the other sizes in separate steps using separate target directories. I.e. if you want offer two larger sized versions of the images then you have to run the HTML generation process two more times with larger size settings. The possibility to save different HTML settings (new feature in BreezeBrowser version 2.8) will be a great help for this. 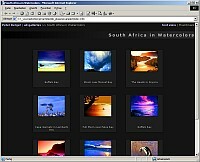 See the next chapter for a detailed description how to make a multi-sized gallery. These two variables defines the layout of the index page. The number of index pages is a result of these settings and the total amount of images. If this variable is set to 1 then a short comment of the shooting data will be shown, including a link to the "full exif" data. If set to 0 no shooting or EXIF data wil be shown at all. Set this variable set to 1 to show the image comments in the fullsize view underneath the image caption. The source for this text is the @caption@ item which is either the JPG comment field or the IPTC caption field, depending on your settings in the BreezeBrowser preferences. var myname = "Peter Berger"
var copyright = "All images are copyrighted." If you leave these variables empty the following default values will be used: @owner@ for myname, @homeURL@ for myhomepage, and "../" (=parent directory) for mygallery. Note that you can set two different sources for the @owner@ token in BreezeBrowser preferences. Using the size array you can define alternative image sizes. There is no limit, you can offer as much sizes as you like. Also the text strings can be changed to your needs. It´s important to set the defaultSize variable to a valid value. As already mentioned you have to start the HTML generation for each size separately. Choose your target directory and start with the default size. Then generate the other sizes in sub-folders. In the example above the small images need to be in a sub-folder called "size1" and the large image need to be in a sub-folder called "size3". Note that there is NO sub-folder called "size2" because it´s the default size! Alternatively you can use BreezeBrowser´s "proofs" function to generate the other sizes. That is possible because only the image files in the sub-folders are used (HTML files can be deleted). Just make sure that the file names of the images in the sub-folders are identical to the ones in the main folder. So when you rebuild your gallery (chaging text, layout, image order, etc.) you only have to rebuild the main folder (default size) and don´t worry about the other sizes. Instead of different sizes of one image it´s possible to offer variations of one image or subject! You can overwrite the "other sizes:" string with the variable sizename. In the example above I offer the same image in b/w and sepia toned. The name of the sub-folders remains the same though ("size2" for b/w images and "size3" for sepia ones). Another idea is to offer different views of the subject (front, side, back, detail). See below for working examples! If you set the variable navigAsThumbs to 1 the links to the previous and next images will show a thumbnail preview. If you set the variable sizesAsThumbs to 1 then thumbnail previews will be shown for the "other sizes". Of course this only makes sense if you do not offer other sizes but alternative views (like I mentioned in the paragraph above and show in the examples below). 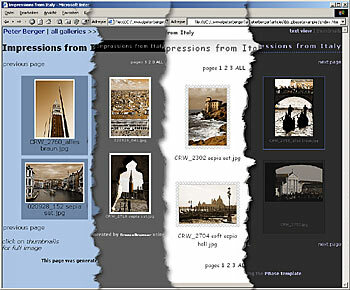 var sizename = "other sizes:"
This example gallery shows the images in different sizes. The browser will remember your preferred size while you navigate through the gallery. With these settings you are as close as possible to the original PBase site. Remember that you only need the sub-folders "size1" (small images) and "size2" (medium images). Because "large" is the default size the images (plus HTML and CSS files) have to be in the gallery´s main folder. Once the alternative sizes are generated you can delete all thumbnail, .htm and .css files in these sub-folders. The text underneath the fullsize images (also in the "text view") comes from the JPG comment fields (showComment = 1). 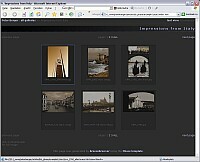 For this gallery I used the famous PBase style "webdev". This example shows different variations of one image. The main folder contains the watercolor images which are the topic of this gallery. In the fullsize view you will find links to a black and white version and the original photograph. Next to the links are thumbnail previews of the alternative images. The b/w images (incl. thumbnails) are located in a sub-folder called "size2" and the unedited images (incl. thumbnails) are located in the sub-folder "size3". Note that the image size of the different variations need not to be the same. However I highly recommend to set the same thumbnail size for design reasons. In this example I used the PBase style "zeroscan". EXIF data is not shown. var sizename = "other views:"
In this example I expanded the idea of variations and show different views from one object. Before the HTML generation I put the images in 3 different folders "front", "side" and "detail". I made sure that the order is the same in all folders and then used the batch rename function of BreezeBrowser in each directory to assign the same file names to the same penguins. So each view of the penguin 1 is called "penguin_1.jpg". Again I enabled the thumbnail preview feature (set the variable sizesAsThumbs to 1 in the settings.js file). After the HTML generation the "side" images were in the "size2" folder and the "detail" images in the "size3" folder. Then I deleted all .htm and .css files (and not the thumbnails!) in these two sub-folders. As design I used the self-written style "winterfun".